Lesley was born in Aberdeen in 1967 and has lived and worked here all her life. Growing up in the countryside encouraged Lesley's love and understanding of nature and wildlife. 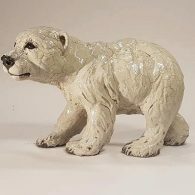 Leaving school at 16 Lesley went on to pursue a career as a graphic artist whilst continuing to follow her passion for wildlife, art and sculpture in her own time. 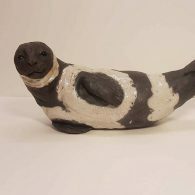 Having an intuitive grasp of animal anatomy, Lesley creates her sculptures almost from memory and uses only a few reference photos to capture the finer points. Using her own special mix of paperclay, which is rolled to around 5mm thickness the clay sheets are formed around a paper support to create the basic shape, as the clay dries more details are added until final texturing and finishing. The pieces are allowed to dry before bisque firing, glazing and raku firing. 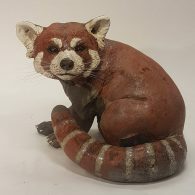 The raku kiln heats to 980oC in around an hour before the pieces are removed, red hot and placed in a sawdust filled chamber, the chamber is sealed and the pieces are left to reduce and smoke for several hours. The resulting raku glazes have a wonderful crackled appearance and a natural smokey finish, this is unachievable by any other means. 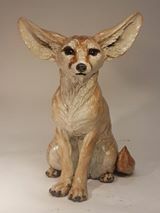 Lesleys work is available through many Scottish Galleries and well as from her own studio/gallery. 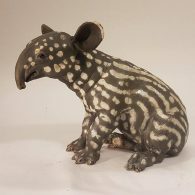 Her paintings and sculptures are collected worldwide. “Three Kingdoms” is a wonderful collaboration with US artist Candace McKay- exploring three very different environments and the animals which dwell there. 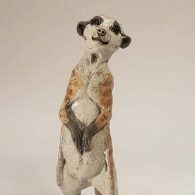 In the desert,arctic and jungle terrains Lesley has put together an amazing collection which includes some of her most popular creatures Polar Bears and Meerkats, Others that pop up on occassion Seals & Tapirs- As well as 2 brand new creations, her first Red Panda and a Fennec Fox. We are so excited to present them at the gallery this month.